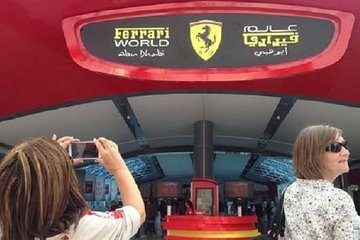 Conoscere Abu Dhabi e Ferrari World in questo tour di un'intera giornata da Dubai. Viaggiando in minivan con aria condizionata, ammiri paesaggi desertici e isole costiere in viaggio verso la scintillante capitale degli Emirati Arabi Uniti. Fai un tour guidato intorno ai punti salienti, visita la Grande Moschea Sheikh Zayed e scopri l'eredità beduina della città presso l'Abu Dhabi Heritage Village. Infine, visita lo spettacolare parco a tema Ferrari World a Yas Island. Avrai tutto il tempo per goderti le attrazioni di ispirazione Ferrari in questo vasto complesso al coperto, tra cui simulatori di corse, giostre e esperienze all'avanguardia. Our tour guide/driver was awesome. Mosque was amazing, Ferrari World was awesome! Great trip. Highly recommend going with this company. We felt rushed at the Grand Mosque only got 30mins. Too long at Ferrari world, had to wait around for transfer back. A great opportunity to see Abu Dhabi, which is quite different than Dubai. While Ferrari World was a fantastic experience, I felt the Sheikh Zayed Grand Mosque was the beautiful place of worship in the world. While not a Muslim, I gained respect for the religion. The activities are totally worth it. The guide provides excellent information from the motorway, explaining the current situation and history of the UAE. The Mosque and Ferrari World are great. Ferrari World requires planning in order to do all activities. The main issue and why the 2 stars is the comfort level, particularly for the high price it has. The hotel pick-up was late, the van in which they transported us was too crowded, leg room minimum. The AC has very poor quality and the windows do not allow to properly see the outside or take pictures. Inside the van we were all sweaty. Also, there is no time for lunch. During our tour, I saw other guided tours to the same places with better transportation. If I had to do it again, I would look for any other company and ask beforehand about the quality of transportation.